Hardwood floors require great care and maintenance to ensure that they always look clean and shiny. However, getting on your hands and knees to scrub and polish them is not appealing. This is why you need a well-designed steam mop to clean your hardwood floors with ease and efficiency. • Use only on hardwood floors that are sealed to prevent damage to floorboards. • Always remove loose dirt and debris with a vacuum before using a steam mop. • Make sure that you read the instructions before using your steam mop on hardwood or any other type of floor. • Remember not to leave your mop in one spot as it can damage your floors if too much moisture gets in. Here is a short list of some of the best steam mops for hardwood floors that are available on the market today. With them, you can make sure that you have well-cleaned floors at all times. 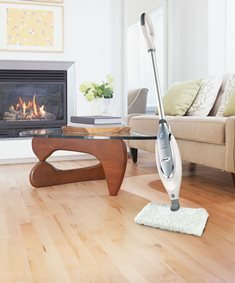 The BISSELL 1940 PowerFresh Steam Mop is a fantastic steam mop that has great features to help you clean your hardwood and other bare floors with ease. Crevices and grouts can be cleaned efficiently with its Easy Scrubber that you can easily flip down. It also has SmartSet Steam Control to give you the right amount of steam for light to heavy cleaning. With its Spring Breeze fragrance discs, you can have a fresh and clean-smelling home every time. Its mop head is low-profile, making it convenient to get to tight spaces, under furniture, etc. For excellent performance, this is one unit you cannot go wrong with. This is a high-rated product that will make your hardwood floor cleaning tasks super-easy. 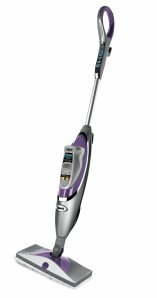 The Hoover WH20200 TwinTank Steam Mop is a lightweight and compact mop that gives you ease and comfort while cleaning and also allows you to move it from room to room without straining yourself. You can disinfect your floors and get rid of 99.9% of germs from the surfaces of your home. You can control the settings to make adjustments for light and heavyweight cleaning tasks. You can use it with just water or with Hoover’s SteamPlus Cleaning Solution that is chemical-free and perfect for homes with kids and pets! 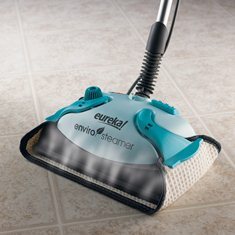 The Eureka 313A Enviro Hard-Surface Floor Steamer is a top-seller among steam mops for hard surfaces and it is easy to see why. This compact unit comes packed with awesome features for efficient cleaning. You can sanitize every inch of your home without using toxic solutions. With its water-level indicator light, you will know when you need a refill. You can also adjust the handle’s height for comfort. 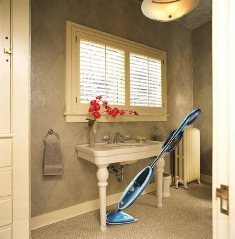 Dust mites, bacteria and other dangerous organisms and allergens can be eliminated effectively with this fantastic steam mop. With this unit, you can say goodbye to buckets, mops and brushes and clean your hardwood floors with ease, comfort and convenience! Sanitize and kill deadly germs and bacteria with this awesome steam mop. The Shark SK460 Steam and Spray Professional is the perfect product for any home. 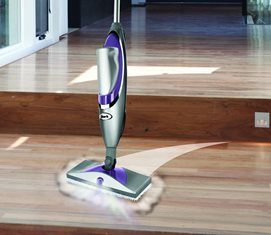 It has Intelligent Steam Control that gives you 3 settings-Scrub, Dust and Mop-so that you can clean any type of surface without any hassle. You can also get more steam for dirt-spots that are hard to clean. You can reuse the washable microfiber pad as many times as you need to and also make good use of the 2 disposable Sanifiber pads that come with this mop. You also get a 20-ounce Steam Energized Cleanser bottle to make cleaning your floors even more effective. This is a top-quality unit that you will love using on your hardwood floors! 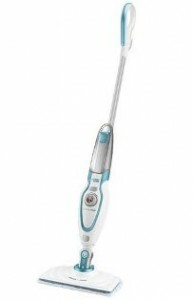 The Black & Decker BDH1720SM SmartSelect Steam Mop is a great mop that has the unique SmartSelect feature that allows you to choose the amount of steam you require to suit the type of floor you are cleaning. Its tank provides you with enough water to continuously clean for more than 22 minutes. You do not have to worry about floor damage when you need to stop for a quick break as the mop automatically shuts off the steam when it is left upright. You do not need to use harsh chemicals with this mop, making it perfect for homes with children and pets. This is one high-quality steam mop that will make your cleaning jobs much easier. When you have the right steam mop for hardwood floors, you can have well-sanitized and sparkling home that is a safe environment for your family as well as your pets!